Jerky is known for being very convenient to find. Whether it’s the local market or even a gas station jerky is easy to come by. The availability of jerky does not, however, coincide with the usual fast food features. This dried meat snack is not a low-quality food. Jerky and especially beef jerky is promoted as a nutritious, low calorie level product, which is low in cholesterol and fat and high in protein and energy. People have developed a growing interest for beef jerky since the nutritional era has commenced. This growth has been attributed to the healthy aspects of beef jerky such as its high protein content.This snack is, in fact, nutritious, wholesome and sometimes the healthiest solution there is. The specific process of preparing the meat includes defatting, dipping in curing solution and drying. This makes the meat lean and never prone to spoilage. If we compared the dried and cured meat found in jerky to uncured regular beef we could notice the difference in protein value. The dried beef has a significantly higher concentration of protein due to the lack of water. In high-quality beef jerky one can even find protein levels as high as 65%. The curing solution in which the meat is immersed is of great importance for the entire process of making jerky. 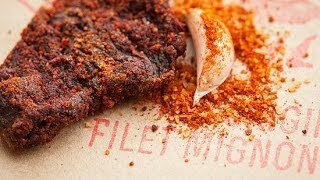 To preserve the nature and nutrition of the beef, some manufacturers even go to the extent of using only salt and vinegar for their curing solution. Many brands nowadays pride themselves on not adding sugar or nitrites to their jerky in order to retain the nutritive feature of the product. Nitrites preserve the meat and make it look scrumptious for a longer period of time. This is characteristic of many cured types of meat. However, there is no final say on whether nitrites are actually safe or harmful in food. Nutritious value is not typical of every type of jerky. When you think about it, the source of protein in the jerky is actually in the beef. This is probably why this type of jerky will remain a classic and easily fall into the “most wanted” category.